I have to admit, I’ve never really understood why people spend so much money on headphones…. I have always limited my spend to about approx. £25, give or take a tenner. However on being sent these AKG headphones to review, I have certainly changed my mind on the matter. They came in their folded form with a hard carrying case presented in a slick black box, making them look pretty special. The assembly was straight-forward, as you would expect, and it’s a case of plug and go. From the moment you pop them on your ears, it’s an amenable experience. The ear-cups are an incredibly comfortable fit and the band is also padded around the top area for extra comfort. Sound quality is fantastic and with the active noise-cancelling feature they are perfect for commuting and air travel. They’re also iPhone compatible. The headphones have been beautifully designed and are perfect for their purpose. 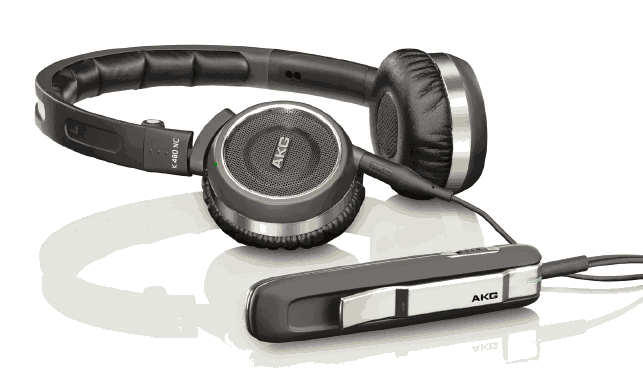 The AKG K480NS’s have made me enjoy my music again and I would recommend them to anyone. They generally retail around the £100 mark, give or take £20. Girls ‘n’ Gadgets award a very well deserved 5/5. I saw some cool colorful skullcandy headphones yesterday. Has anybody used them for gaming? How are these ipod compatible? Is it just ‘cos they have a headphone socket?